Are you looking for a professional low cost Removal Company in Stevenage, Letchworth or Hitchin ? Then we can help, you’re probably tired of looking through pages upon pages of removal companies and you just want to get a booking made so that’s one less weight on your mind, why not call us here at TH Removals today? We go above and beyond to offer a professional, swift service to our clients. As house removals go, you’re unlikely to find another company out there that pays the close attention to detail that we do! We specialise in offering the most competitive rates on the market – meaning that you get to benefit from the wealth of experience that our staff have, without paying a small fortune. There are quite a few companies in the area of Stevenage, Letchworth and Hitchin – but few have a dedication to providing the best possible service as we do. One thing that we’d strongly advise you to be vigilant against when hiring a house removals company is those that cut costs by not insuring their vans properly. If you go with removal companies that aren’t insured, any damage or losses caused during the removal process will not be compensated. Here at TH Removals we are fully insured – and we also have public liability insurance cover up to £1 million. 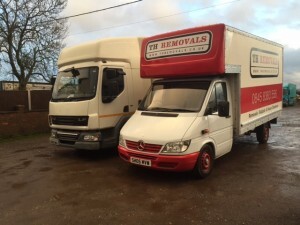 Our removals firm was started up back in 2000. Since then we’ve come a very long way – we’ve made a lot of clients very happy, and we’ve moved an awful lot of property! One thing that we’ve learnt from our time in the house removals industry is that experience is the key to success. Although no two house removals jobs are ever the same, having a wealth of experience allows workers to get the job done properly, in as short of a time frame as possible. Time really is of the essence when it comes to removals -we fully appreciate that. Our workers are all motivated, enthusiastic individuals, which means that they’ll always go the extra mile to ensure you’re completely happy with the removals that we work on. We give our employees the tools that they need to do the job properly and effectively. Some examples include a satellite navigation system so that they get from door to door on the most direct route, and of course a sack trolley for moving those extra heavy items to and from the van. We operate throughout Stevenage, Letchworth and Hitchin – so what are you waiting for? Pick up the phone and talk to us here at TH Removals today to see how we can help you.